These packages represent our most requested combinations and can be easily modified to your exacting needs. Click on a package for details. 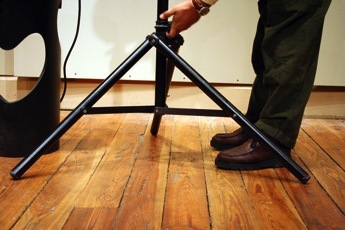 Step One - Set up speaker stands. Step Two - Place speakers on stands. Step Three - Remove cover from mixer/amp. Step Four - Plug speaker cables into speakers and then into mixer/amp. Step Five - Plug microphone cables into microphones and then into mixer/amp. Step Six - Plug power cord into mixer/amp and into wall outlet. Then turn mixer/amp on. 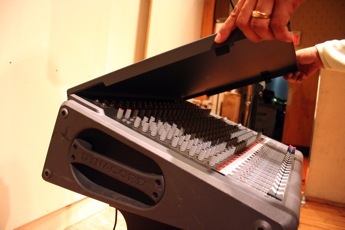 Step Seven - Turn up channel input trim control then turn up channel fader, then turn up master fader. Even if you are familiar with the use of the system, set it up as far in advance as time allows and allot yourself plenty of time. That will give you time to fully understand it's operation and if anything is wrong will give you enough time to CALL US to help solve the problem. Believe it or not, we want everything to work for you too. If you have any doubt that you will be able to set up the system and use it successfully then we would be more than happy to arrange for one of our trained personnel to deliver and operate it for a reasonable additional fee. When finished using the system please reverse the procedure, wrap up the cables properly and return to us on time. If you have any questions or problems CALL US IMMEDIATELY. You can find more help in the Movie section. Step Three - Place speakers on stands. Step Four - Plug speaker cables into speakers and then into amp. Step Five - Plug power cord into amp and into wall outlet. Then turn amp on. Step Six - Turn up amplifier master. Step Two - Place speakers on stands then carefully lift into place. Step Three - Plug speaker cables into speakers and then into amplifier. Step Four - Plug power cord into into wall outlet. Then turn amp on. Step Five - Turn up amplifier master. Step Two - Place speakers on stands and then raise into position carefully. of a powered sub and two monitors. If the quality of your production doesn't matter and you're looking for cheap entry level stuff we will be happy to give you the number of our competition.